Sumithra Vasudev, the pradhana sishya of Sangita Kalanidhi Smt. R. Vedavalli, is an experienced musician and an A Grade artiste of the All India Radio, who performs regularly in India and abroad. Sumithra has been performing since the age of eleven and has received numerous titles and award including the title of “Yuva Kala Bharathi” and theUstad Bismillah Khan Yuva Puraskar National Award. Sumithra’s music stands out for strict adherence to tradition and classicism while emphasizing manodharma within the specified lakshana. She specializes in raga alapana and Niraval singing.Sumithra was conferred the title of ‘Sangeeta kala ratna‘ in the Cleveland Tyagaraja Aradhana in April 2012 in Cleveland, Ohio. Sumithra Vasudev has been a sishya of Smt. R. Vedavalli for over two decades. She has trained under her in the Gurukula style of learning. 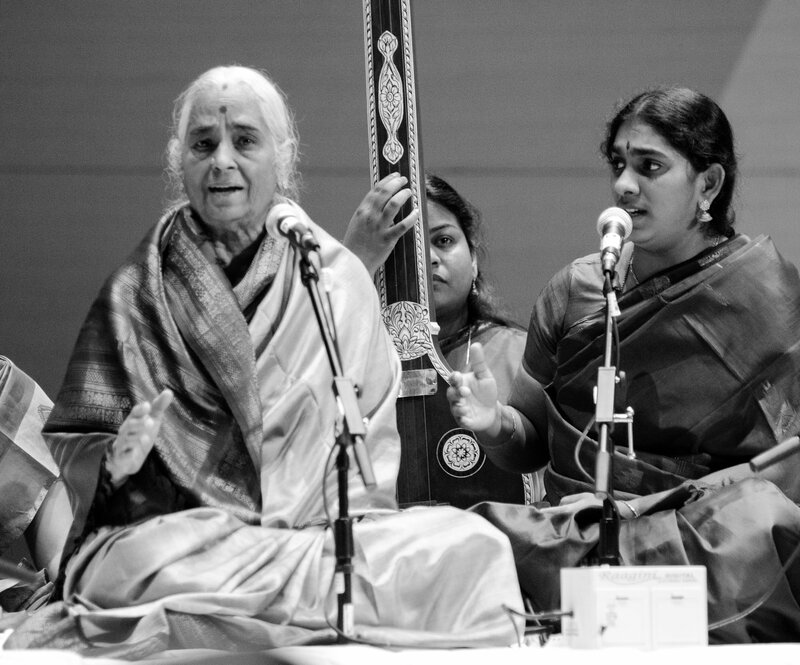 Sumithra provides vocal support to her Guru in her concerts, and participates in all her Guru’s thematic presentations and lecture-demonstrations. Received her M.A with First Class. Sumithra is an A-Grade artiste of the All India Radio and performs regularly on AIR. Sumithra received the prestigious title of “YUVA KALA BHARATHI” from Bharat Kalachar in 2008, the title of “NADA OLI” from Nada Inbam in 2004, and the title of “YUVA KALA JYOTHI” from the Kanchi Kamakoti Peetham in 2001. Sumithra received the ‘Best Vocalist’ award in the Sub-senior category from the Music Academy on Jan.1st 2012. She received the ‘Best Lec-dem’ prize from the Music Academy on Jan.1st 2012. Sumithra received the Washington Sivakumar Memorial award from Brahma Gana Sabha in 2012. Sumithra received the Ustad Bismillah Khan Yuva Puraskar award instituted by the Sangeet Natak Akademi in 2008 in recognition of her achievements in Carnatic Music. Sumithra was adjudged “Best Sub-Senior Vocalist” for 2007-08 by the Music Academy. She has received the “Best Junior Vocalist” award from them for the years 2000, 2001, 2004 and 2007. Sumithra has been adjudged Second Best among artistes performing for the Global GNB Birth Centenary celebrations in SAFE’s October Music Festival in 2009. In her first concert at the age of 11, Sumithra received the Ambujam Krishna Award for the Best Concert in the “Spirit of Youth” festival of the Music Academy in 1992. Sumithra has received the FELLOWSHIP from THE SANGEET NATAK ACADEMY to have special training in Ragam-Tanam-Pallavi under senior vidwan Sri. B.Krishnamurthi, for the year 2008-2009. She was awarded a scholarship by THE MUSIC ACADEMY, CHENNAI under the Ariyakudi Ramanuja Iyengar scholarship scheme for the year 1998-99. She was awarded the STERLING HOLIDAY RESORTS SCHOLARSHIP for two years from 1995 to 1997. She received the Tanjavur Srinivasa Iyer Endowment for her concert in the Gokulashtami Series of the Krishna Gana Sabha in 1998. Sumithra was invited to perform in the November Fest organized by The Hindu in 2008. She was featured in Sangeet Pratibha, a festival for young musicians under the auspices of SANGEET NATAK ACADEMY in Vishakhapatnam in October 2007. Sumithra was invited to perform in the Thyagaraja Aradhana in Muscat in 2002. Sumithra set to tune and rendered verses from the Saundarya Lahari, which was released as a VCD in 2001. Sumithra has set to music verses from the Nalayira Divya Prabandham and given thematic concerts on the Prabandham in Coimbatore and Bangalore in 2003. Sumithra has set to music stotras of Sanskrit scholar and writer, Dr. V. Raghavan. A double CD album called “Kavi Kokila Manjari” where she has rendered these and some of his other compositions was released in 2008. She has presented research papers in Sanskrit seminars, including the All India Oriental Conference in 2000, on Musical Aspects in Naganandam and Kalidasa’s Sisupalavadham. She is involved in the translation project of the monumental work ‘Sangita Sampradaya Pradarshini’ taken up by the Music Academy. She has also been a part of other publication works like the Rasamanjari of Bhanudatta and ‘Bunch of Javalis’ by Dr. Pappu Venugopala Rao. Sumithra presented a lecture demonstration on ‘Role of Gamaka-s’ in the Annual Conference of the Music Academy in December 2011.